Heaven's Best is a low moisture quick drying method that won't over wet your carpets. We feature nontoxic cleaning products that are safe for your family and pets. The Heaven's Best trained, professional technicians are prompt and courteous. 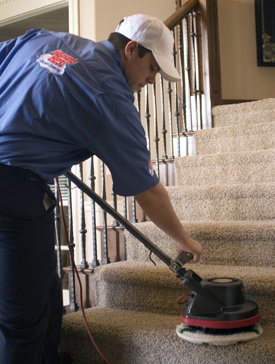 We'll give you the friendly reliable service you expect from the leaders in carpet care. Call today for a free estimate. Heaven's Best Carpet Cleaning, a company you can trust! Heaven's Best has been cleaning carpets since 1983. We've stayed in business because we know what it takes to make you happy. With our specially formulated cleaning solution, we can get spots out that other cleaners left behind. If the stain does come back, so will we. We want you to be happy you chose Heaven's Best. While we specialize in cleaning carpet, we do offer a wide variety of cleaning options. The services we provide include upholstery cleaning, tile and grout cleaning, hardwood floor cleaning, and hard surface cleaning. Our hard surface cleaning service covers granite, marble, and natural stone polishing. With Heaven's Best, we can take care of all your floor cleaning needs. Give us a call today; you'll be glad you did. Locally owned and operated for over 12 years. Member of the Wesley Chapel Chamber of Commerce. "Great job again! Very Friendly. Thanks for the professional service." "Excellent service. Will keep on using."